BOB ABERNETHY, anchor: This Memorial Day weekend, as happens each year, half a million motorcycle riders are expected in Washington, D.C. from all over the country. They call the event Rolling Thunder. The bikers will parade in honor of Americans who have died in war, or are missing or have been prisoners of war. Earlier this month, in preparation for the riding season, several thousand bikers descended on Paterson, New Jersey to have their bikes blessed by a Catholic priest who is also a biker and who ministers to all those who ride. Lucky Severson was there, too. 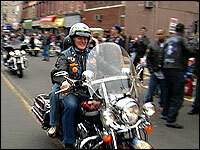 LUCKY SEVERSON: They come to downtown Paterson, New Jersey year after year the first Sunday of May to this special motorcycle Mass to get their bikes blessed. It’s a diverse bunch, from all walks of life: some rough and tough, some you might not expect. 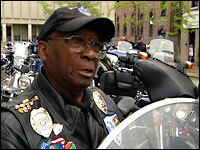 Gloria Tramontin Struck, for instance, 83 years old, is the longest serving member of the Motor Maids women riders. GLORIA TRAMONTIN: They think everybody is a Hell’s Angel. I’m a great-grandmother. I go to church every Sunday. SEVERSON: This year as many as 2,000 bikers from all over the Northeast showed up, and like Johnny M. and Johnny B., they take the blessing very seriously. (speaking to both men): Getting your bike blessed, is that important? JOHNNY B: Well, you’ve got to have God on your side, you know. 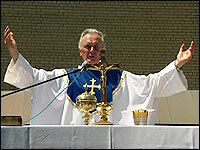 SEVERSON: The Mass is conducted by the man who started this tradition 39 years ago — when Richard Nixon was president. That’s him, Father Mark Giordani, gliding in on his Harley Davidson Road King. As far as they’re concerned he’s one of them, but with much better connections. Father MARK GIORDANI (Rector, St. John the Baptist Cathedral, praying at altar): Heavenly Father, we ask you to bless us as we kick off the riding season. Father, be with us as we experience the thrill of the open road and the marvel of the motorcycle. SEVERSON: Many who attend Father Mark’s bike blessing don’t attend church regularly or at all. Fr. GIORDANI: But, you know, they read the Bible. They say their own prayers, and they offer prayers for those who are sick, so there is a special connection with God in their own unique way. I mean, what does God really want from us? A loving, humble heart. So uncomplicated. SEVERSON: The altar is on a flatbed truck parked between the Paterson County Jail and the St. John the Baptist Cathedral, where Father Giordani is now the rector. He’s from Italy, and when he first came here he graduated from a Vespa motor scooter to his beloved Harley. Fr. GIORDANI: It’s just exhilarating — the sense of freedom, the sense of enjoying the beauty of God’s creation, and it’s just a powerful and magnificent gift for me. SEVERSON: For the bikers, Father Mark’s gift is the blessing he gives. David Bove is a believer. DAVID BOVE: I got blessed last year, and a week later I had another motorcycle that I didn’t have blessed, and I crashed. Tomorrow is going to be my first day back to work after a year after getting run over. SEVERSON: After the Mass and Communion, Father Mark gets down to the business of blessing humble bikes, as well as those that make a lot of noise. Eighty-one-year-old Frank Brown Sr. is not a Catholic, but it doesn’t matter. FRANK BROWN, SR.: I go to all churches, you know, and when the holy water’s hitting me, it’s alright with me too. In fact, I move in a little closer so I can get a dash. Fr. GIORDANI: Sometimes they ask for a double blessing. I say, “Well, you’ve been blessed already,” and they want more holy water. SEVERSON (to Fr. Giordani): I thought you were pretty liberal with that holy water today. When he first arrived in Paterson, he asked to be assigned to the poorest parish. Today his congregation has grown to 3,000, the majority Hispanic. 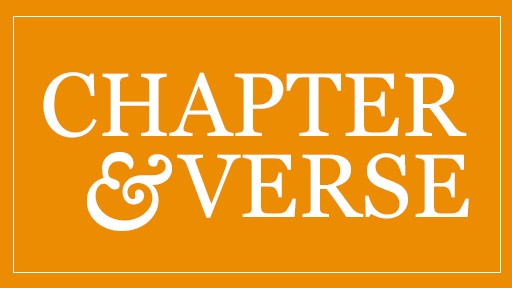 He’s also the chaplain of the county prison, the Paterson police and sheriff’s office, and 10 days before 9/11 he became the chaplain to the New York-New Jersey Port Authority. And then there’s his motorcycle mission, which reaches people who sometimes feel unwelcome at church. Mr. BOVE: We’re ostracized just for our hobby, our mode of transportation, and it’s nice to be in a group of people that kind of look like me. We all have the same mindset. SEVERSON: Like Bruce Hazelman, riding for 40 years. BRUCE HAZELMAN: Bikers aren’t bad people. They’re just normal people that have a hobby and want to ride their motorcycle. SEVERSON: Nobody loves to ride more than the biker priest, and it’s pretty clear that his “hog” belongs to an unusual rider. (to Fr. 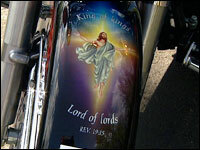 Giordani): So you’ve got the whole story of Christ on the fender of your Harley Davidson? Fr. GIORDANI: Basically, that’s right. We have the Nativity. We have the Crucifixion, and the Resurrection, and, of course, the Holy Spirit on the tank, which branches out to the saddle bags. SEVERSON: Is this what Jesus would drive? Fr. GIORDANI: I think if he were physically present here on earth today, definitely this would be his choice. SEVERSON: Hard to imagine this machine would be an evangelical tool, but he says it has an impressive record, like the time he came across another biker in Nova Scotia who asked if he could confess. SEVERSON: Father Giordani says he has been blessed by his association with bikers: the time, for example, 10 years ago when he was diagnosed with a rare tongue cancer. One biker set up an altar in his garage to pray for Father Mark’s healing. SEVERSON: And the rest is history. Father Mark’s cancer has been in remission for several years, and God willing he will be back for another blessing next year. So will the bikers. For RELIGION & ETHICS NEWSWEEKLY, I’m Lucky Severson in Paterson, New Jersey.